As a developer/designer, I too often have a tendency to chalk up SEO to snake oil and fabrications. While there are a ton of black hat SEO tactics out there, there also at least a few things that every site owner should take care of. I use Yoast’s SEO plugin as a sort of checklist for making sure I create sitemaps, use proper page titles, and set up proper redirects for expired pages. The SEO plugin actually does quite a bit, and I doubt I’ve had proper time to explore each and every little thing. Basically, the plugin works both in the background and at your discretion to improve and optimize your site in search engines. No snake oil here, just simple things you should be doing. 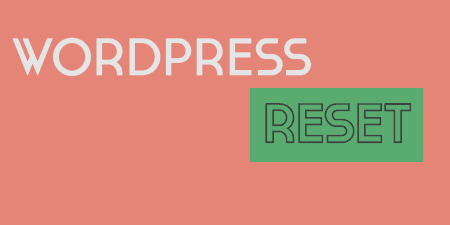 There are several things that WordPress SEO enables you to do. 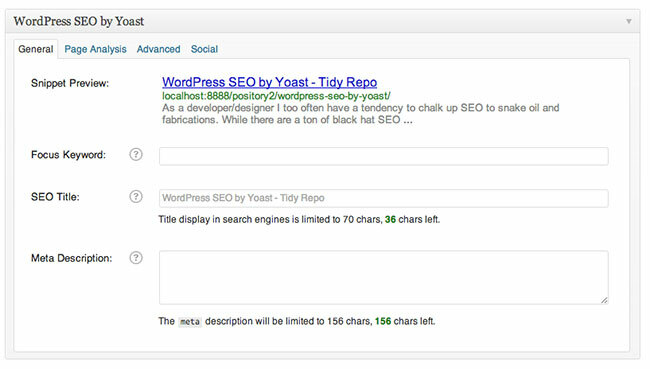 All of your options are listed out in the new SEO custom post type in your admin panel. From the main dashboard, you can enter your Google Webmaster tools, Bing Webmaster tools, and Alexa details, and set tracking and security options. From there, it’s best to explore your options one by one. You can set default page titles and metadata in Title & Metas, set up your social media channels in Social (Open Graph and Twitter Cards supported), change XML Sitemap options, edit Internal Links and Permalinks, and change your RSS settings. Each option will walk you through your choices, so feel free to explore. One more useful function is the Edit Files section. 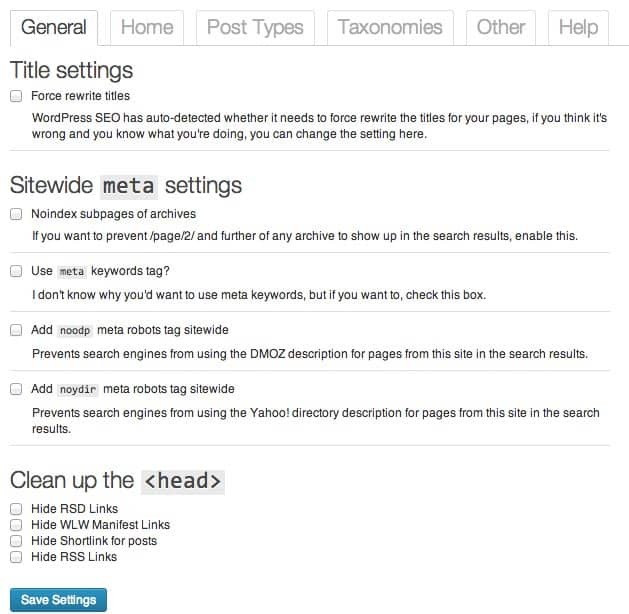 From here, you can edit your .htaccess and robots.txt files right in your admin panel. Of course, only use this if you know what you’re doing, but I’ve found it to be endlessly helpful. Let’s say you need some help setting up XML Sitemaps. 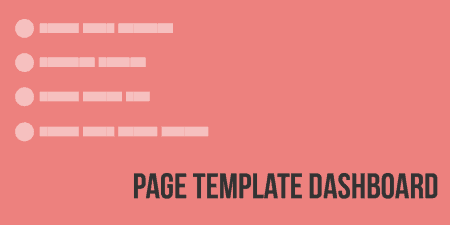 These sitemaps tell search engines what pages are on your site, and their order of importance. 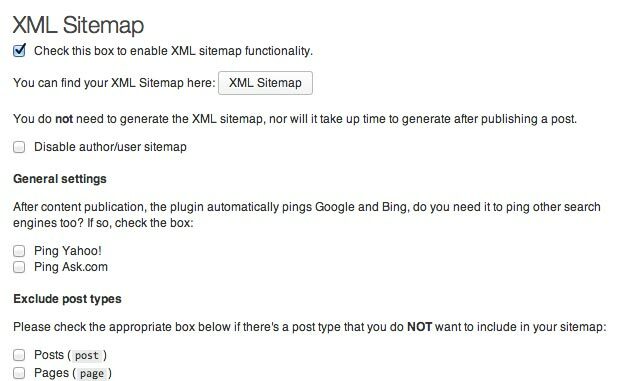 If you visit the XML Sitemaps tab in the SEO tab of your admin panel, you will see a whole list of options. You can select which post types and taxonomies you want to include or exclude in the sitemap and which search engines you should ping when a sitemap is updated. There is also a meta box that will be added to the bottom of each of your post pages, underneath your post editor. From here, you can edit details specific to a page. For instance, you can add a properly optimized title and description and set up any page specific redirects. This will be where you actually spend most of your time. If you are working with a team of content publishers and editors, it is best to work this meta box right into their workflow. Once they are done writing the post, make sure they fill out as many details as possible so that you don’t have to go back and change them all around later. Yoast uses a pretty solid freemium model for this plugin, so it’s completely free to use but there are costs associated with some premium upgrades for sites that want to target special content types such as video. Yoast is also a full-service SEO firm so I imagine they hope to bring in some customers through their plugin. For developers out there, Yoast keeps their API documentation up to date in case you need to hook in and make some changes. The WordPress repo support forums are maintained, though not very well. In fact, Joost De Valk, the founder of Yoast, has some very specific opinions on forum support, so they have recently moved to all email support. That means if you haven’t purchased an upgrade it might be hard to find help, though there are people in the community you can reach out to.